An ambitious new study aims to explore the direct cost-benefit relationships of international students as they pertain to host institutions and host countries. The study, The financial impact of cross-border student mobility on the economy of the host country, by the German Academic Exchange Service (DAAD), reveals that the tuition, immigration, and taxation policies of the host country are huge factors affecting the economic benefits created by international students. The study found a large range of economic impacts from international students across the six European countries involved. It also revealed that in some countries, it can take much longer for the economic benefits of international students to outweigh the costs of hosting them. Perhaps most interestingly, the German research highlights how important retaining international students post-graduation can be to the host country economy. A calculation of how long it would take each country participating in the study to realise benefits from international students more substantial than the costs incurred in hosting the students. The cost to a national economy of hosting international students of course goes down in countries like the US, Canada, UK, and Australia, where international students pay differential fees designed to recover the full costs of the student’s programme of study. While these countries were not part of the German study, we can reasonably imagine that the economic benefit of international students for such host countries is considerably higher given the greater tuition differentials involved. International students do end up producing a net positive economic benefit for a host country, and this is distributed through the economy differently depending on how the economy functions. Much of the eventual benefit is realised over time – long-term benefits, especially caused by an international student’s remaining in the host country to work after graduation, stand to be much higher than the short-term economic impact of the student’s study period. This is because of the creation of jobs and new spending, as well as revenues from taxation, that international graduates generate by remaining in the country to work. We have reported previously on how crucial it is to increase the “stay rate” of international students. 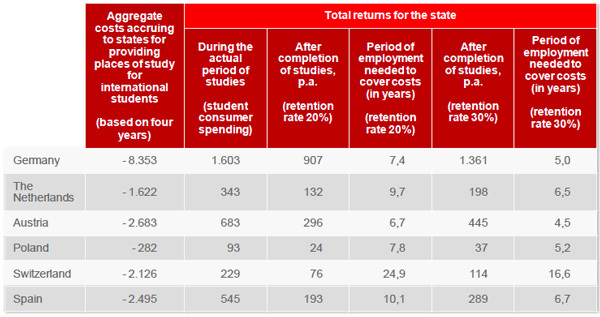 That earlier post cited the example of the Netherlands, which has increased its international student numbers from 35,092 registered in 2006 to over 58,000 in 2012 and which has discovered that retaining 20% of international students after their graduation would generate economic benefits worth €740 million. For more on factors shown to be beneficial to increase the stay (retention) rates of international students, and on various countries’ strategies for this goal, please see our earlier article. This entry was posted in Europe, Germany, Higher Education, Most Popular, Netherlands, Poland, Regions, Research, Spain, Switzerland, Work Abroad and tagged international students, student recruitment, culture exchange, Most Popular, youth accommodation. I like gathering useful information, this post has got me even more info!